Norma started working with her Personal Trainer, Kenny Hodges, in November 2010, just after she lost her wonderful husband of 47 years. Fortunately, Norma had a wonderful support system of family and friends to help her deal with her loss. 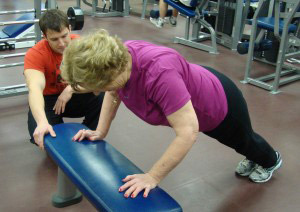 Her son, Matt encouraged her to start exercising again to feel better mentally and physically. She started meeting with Kenny 3 times a week, working with weight machines and doing cardiovascular exercise on her own. After getting into an exercise routine and adjusting her eating habits, Norma gradually started to lose weight.